The Amerindians were the earliest settlers of St. Lucia. This is supported by archeological evidence of Arawak settlements existing as early as 200 A.D. They were a peaceful tribe with highly advanced traditions of agriculture, pottery, weaving and building. Years later, the warlike Caribs arrived, annihilating the Arawaks. “Ioüanalao” was the name used for the island by the Arawaks, while the Caribs referred to it as “Hewanorra”, both meaning “there where the iguana is found”. 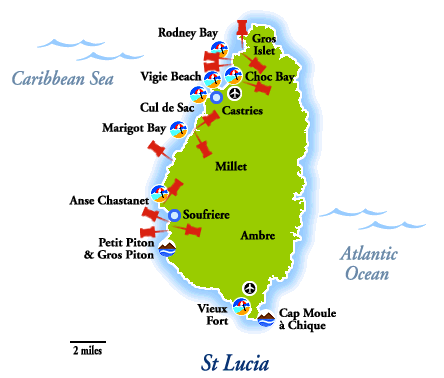 The island’s current name, St. Lucia, was first used in the late 16th Century. The Europeans gave St. Lucia the moniker “Helen of the West”, comparing her stunning natural beauty to that of the famed Helen of Troy. An exact date of their settlement in St. Lucia is unknown, but the island appeared on a map made by the Spanish explorer Juan de la Cosa in 1500. A pirate was the first known European settler, Francois Le Clerc. He was also known as Jambe de Bois (“Wooden Leg”) and, beginning around 1550, used Pigeon Island to stage attacks on passing Spanish ships. Although the Spanish never attempted to colonize the island, they are credited with giving Saint Lucia her name. However, it is also maintained that a group of French seamen who were ship­wrecked on the island on December 13th, 1502 named the island after the Virgin-Martyr of Syracuse, “Sainte Alousie. Regardless of the mystery and myth about discovery and names, December 13th is celebrated in by St. Lucians as their National Day. It wasn’t until 1605 that a British settlement was established at the southern end of the island. They were on their way to Guyana aboard the Olive Branch. Sixty-Seven settlers landed and purchased huts from the Caribs. However, one month later most of them were eradicated by the very same Caribs, leaving only 19 settlers who escaped by fleeing to South America in a canoe. It was in the region of 1625 when the Dutch established a base in the same area and built a fort, providing the name for the present day town of Vieux Fort. A second attempt was made by Sir Thomas Warner on behalf of the British to settle on the island in 1639. This lasted one year before being once again wiped out by the hostile Caribs. The French first attempted colonization in 1651 when the Governor of Martinique acquired and claimed the island in the name of France. A few years later in 1659, a dispute over Saint Lucia’s ownership arose between the French and the British, who by this time had a strong base in Barbados. The British wanted the picturesque island as a base from which to observe the French operation in Martinique. The French felt that the island, being the closest neighbour to their political and military force in Martinique, would be a logical settlement for them to maintain. The island was politically flipped between the French and British over a period of 150 years, changing hands a total of fourteen times until 1814 when Saint Lucia finally remained under British Control. Soufriere was the first town established, settled in 1746 by the French. In the 1760’s the French brought the sugar industry and with it a period of prosperity to the island. By 1780, twelve French towns had been founded and the first sugar estates built. Within 15 years this had expanded and 50 more estates were in operation. The Great Hurricane of 1780 destroyed many plantations but with slave labour, the damage was quickly repaired by the French. As the French brought prosperity, they also brought their revolution. What was built was largely undone owing to the destructive unrest cause. The British took this opportunity to re-capture the island and then returned the slaves (freed by the revolution) to their respective plantation. Many refused to returned, ran to the hills and raged battles against the British. They became known as the freedom fighters (also called Brigands) and finally surrendered under stringent conditions of freedom, becoming the first West Indies Regiment of the British military. Emancipation finally came to the island in a peaceful transition on August 1, 1838. 1814 brought peace to the shores of “Helen” as the two nations signed the treaty that ended the battle of ownership. St. Lucia went for the final time to the British. English became the official language, however a blended form of primarily French and African phrases became the dialect of much of the population, hence the creation of “Patois”. In 1951 suffrage was granted to all citizens over the age of twenty-one as St. Lucia moved towards independence. With the appointment of the first Ministers of Government in 1960, the island enacted a new constitution. This constitution expired in 1967 when England granted the island full self-government. On February 22, 1979, St. Lucia became an independent nation, but remains a member of the British Commonwealth.